The trial of an evangelical preacher accused of making "grossly offensive" remarks about Islam has begun. 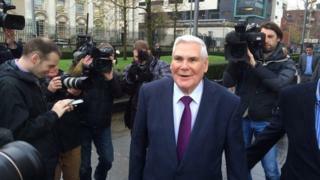 Pastor James McConnell denies two charges relating to a sermon he gave in a Belfast church last year. Belfast Magistrates' Court heard that Pastor McConnell called Islam "satanic" and "heathen". His remarks were made at the Whitewell Metropolitan Tabernacle in north Belfast in May 2014 and were streamed online. Pastor McConnell, 78, of Shore Road in Newtownabbey, County Antrim, is charged with improper use of a public electronic communications network and causing a grossly offensive message to be sent by means of a public electronic communications network. The prosecution against Pastor McConnell centres on his remarks about not trusting Muslims. In a sermon criticising Islam in May last year, the pastor said: "I don't trust them [Muslims]." A prosecution barrister told the court this meant the pastor was saying he did not trust a single Muslim. From the back of the court, Pastor McConnell shouted "no". The barrister acknowledged the shout, but said the sermon had been grossly offensive, and was outside any legal protection given to preachers from the pulpit. The court was also read transcripts of an interview the pastor took part in with BBC presenter Stephen Nolan. The barrister said the pastor was "unrepentant" in the interview about what he said about Islam. However, he made it clear that the prosecution was based on what was said in church, not in the BBC interview. More than 100 supporters of the preacher sat in the public gallery in court 12.